During the fall of 2016 Claes Rangsjö contacted me asking if I was interested to join him on a mission trip to Nepal. Claes and I are old friends since our teens and has done all kinds of stuff together as teenagers. We both came to the Lord in our upper teens which also gave a totally new dimension to our fellowship. The purpose with our trip to Nepal was to teach pastors and leaders. Claes was to teach on The Gospel of Mathew as a part of the 4 year training program which PLT offers pastors in Nepal and India. My contribution was different and lay somewhat outside PLT:s regular curriculum. The plan was that I should give a concise teaching on biblical principles for economy, money and enterprise etc. I don't consider myself an expert in these areas, but as self-employed these areas have always interested me and not least as Christian out of a "Kingdom of God perspective". Even though working life and economy occupies a big part of our everyday life we don´t teach much about it in our churches. Just as man and the whole creation came under decay through the fall of Adam, so has the reconciliation through Jesus death on the cross given/offers us salvation, righteousness and restoration, for both mankind and the whole creation. For me this means there is a "Kingdom of God dimension" available in every area of life. Not at least in our working life, economy and enterprises/businesses. In the midst of this situation the kingdom of God broke forth with power - many people gave their lives to the Lord. In this setting I had the opportunity to share a simple teaching from the Bible about money, economy and enterprise/business. There were much enthusiasm from people - probably because the teaching related to their life situation. A couple of years later those Christians started a small union bank - IKTUS. New legislation also paved the way for this initiative. We continued to support their bank - it was very successful and generated hundreds of small businesses, lifted people out of poverty and gave hope. Some of us who participated in this, experienced a clear leading to start a economical association in Sweden with the purpose to work with micro financing - IKTUS Sweden. This as a backdrop to my role on this mission trip to Nepal. For me the journey started for real when Claes and I, before takeoff from Arlanda airport, made a stopover at Hans and Lotta Sunbergs place, tasted Hans delicious fish soup, sharing thoughts and visions about Nepal - Hans then took us to the airport. The journey went very well with half a day stopover in Doha, Qatar - and then finally arriving in Katmandu. Claes and I had much time together for fellowship and sharing things with one another. This was my first visit in Nepal and my first road trip from the hotel in Dhulikel to the church in Panauti was somewhat of a cultural chock. People everywhere, all kind of animals and a conglomeration of all means of transportation in a mess which was moving forward as a slow-flowing pulp - but soon I got used to it. The vision is not only a "paper tiger" but something people are really submitted to. Kalusing Tamang who planted the church in Panauti started out to win his neighbors and then gathering them in his living room - this was around 1994 - today they are around 600 members, including 5-6 satellite churches. It appears in conversation with Kalusing that it has resulted in a high price. The daughter Sarita started teaching the children when she was only 12 years old. She has a call for children's ministry and a vision to develop educational materials for children - is also responsible for children´s ministry in a congregation group in Kavre district (20 churches). 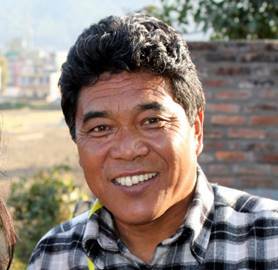 Sarita is married to Mankaji - who is PLT's coworker in Nepal. Mankaji is also responsible for youth work within the same congregation group. We also met Hanuk - a cousin to Sarita - a talented young man who, through US-AID, worked on mapping Nepal's water resources for future hydropower development. After completion of the project, Hanuk planned to study a Master's degree program. I was kidding him that he will probably one day become energy ministers in Nepal!! Who knows? It was also incredibly inspiring to meet the pastor group. Unfortunately, we did not get to know each one because of time shortages and language barriers. One is impressed that many of these simple humble people are responsible for congregations with hundreds of people - churches that grow and multiply. In my teaching, I pointed to God's original plan in His creation - that both man and creation were blessed by Him. That man was called to use and preserve creation - that our working life today is an extension of that calling. And that the consequences of the fall are repealed in and through Jesus Christ - and therby also the curse pronounced in Genesis 3 is broken through the atonement sacrifice of Jesus: "Cursed is the ground because of you; through painful toil you will eat food from it....It will produce thorns and thistels for you...By the sweat of your brow you will eat your food.."
Just like in Kyrgyzstan, I felt there was a great interest in these truths that can change our practical everyday life situation - give people hope and faith that circumstances can change. It was with great gratitude and joy Claes and I boarded the plane in Kathmandu for our trip home. We are carrying our brothers and sisters in Nepal with our hearts. Their stories inspire us to a greater surrender to what God has in store for our lives!